The data presented by Andrew Rhodes, Mexico's national commissioner for protected natural areas, was cheered but scientists quickly warned that it does not mean the butterflies that migrate from Canada and the United States are out of danger. This winter, researchers found the butterflies occupying 14.95 acres (6.05 hectares) of pine and fir forests in the mountains of Michoacan and Mexico states. That's an increase from 6.12 acres (2.48 hectares) a year ago. They arrive in such numbers that their population is measured by how much surface area they cover. This year's is the biggest measurement since the 2006-2007 period, Rhodes said. A low of just 1.66 acres (0.67 hectares) was recorded in 2013-2014. Jorge Rickards, director of World Wildlife Fund in Mexico which participates in the monitoring, cautioned that the butterflies like other insects see their annual populations rise and fall and the monarchs have had a declining trend. This year's number was positive, but there is no guarantee it will continue. The first monarchs crossed into Mexico more than a week later than usual on Oct. 20 owing to rain and cold along the Texas-Mexico border, Rhodes said. "Once in Mexican territory, the butterflies occupied an area that gives us a lot of hope for the future," Rhodes said. Scientists said the approximately 15-acres (6 hectares) coverage should be seen as a minimum for the viability of the migrating monarchs in the future. Ryan Norris, an ecology professor from the University of Guelph in Ontario, Canada said it would be dangerous to think the improved coverage in their wintering grounds meant the butterflies were out of the woods. 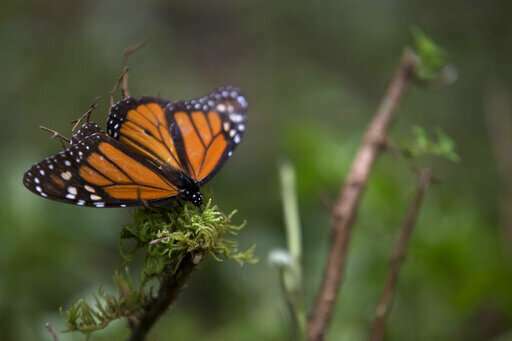 "It buys us time, but that's the best it does," said Norris, who was in Mexico City for scientific meetings about monarchs. Norris saw little connection between this year's increase and the concerted conservation efforts along the butterflies' migration route, especially in Mexico where the government, with the help of local communities, has nearly eliminated illegal logging inside the butterflies' protected area west of Mexico City. "It was a Goldilocks year this year," he said. "Not too hot, not too cold, it was perfect." Chip Taylor, director of Monarch Watch and an ecology professor at the University of Kansas, who runs a monarch tagging program, echoed that caution. "It's not going to be replicated next year, not even close," Taylor said. Above average temperatures in Texas next year will cause problems for the monarch production, Taylor said. Last spring, cold temperatures north of Texas kept the butterflies there to lay their eggs, but when it's warmer they wander farther north too soon and the population does not grow as well, he said.